« Trout and the Flat Earth Society. I can still recall the early days when I fished the streams of the Limietberg, Schalk Van Der Merwe and I would climb down the concrete retaining blocks of the old road bridge to access the river. There was no fancy tunnel through the mountains and the trip would always be prolonged by the slow progress of trucks up over the Du Toit’s Kloos Pass in front of us. With only a few places to overtake and the fishing awaiting us on the other side it was frequently a frustrating journey. On the river there were no beats, no catch and release, you only had to notify the club that you were going to be on the water and that was it. We rarely saw anyone else but there were a few spots which we might stake out early where late arriving anglers wouldn’t be able to get in front of us on the stream. There were more trees on the rivers in those days, the new freeway had yet to be conceived and on some sections of the stream the old road ran close enough to the river, with picnic spots along the way such that it wasn’t uncommon to sneak around a bend in pursuit of trout only to find someone bathing in your favourite run. We didn’t have two weight rods back then either, the standard was a #4 weight, although of generally sloppy action and we used to fish a mixture of dries and nymphs although the dries where our favorites, we already had visions of some kind of “purism” despite the fact that the trout would pretty much eat anything. 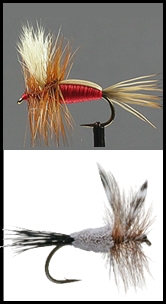 I can recall that we experimented with all manner of indicators and tied weighted nymphs to represent the heptagenid mayflies as well as the more standard baetis going to some lengths to flatten the bodies and weave in legs and eyes and all manner of subtleties. To be honest we thought that we were pretty hot at this. Occasionally we would venture further into the mountains, but there was no real path in those days and a long hike up the river would require and equally long return trip back down the river bed at day’s end. Big bushy high floating flies were all that was required. Dry fly fishing was a case of flipping a buoyant dry into the pockets and waiting for a take, if you missed it there was little real problem, another cast, perhaps with a little more focus and in a serious looking crouch and the fish would come again. They would always come again and give you a second chance. The flies were huge by today’s standards, size 12 or even 10, buoyant deer hair patterns, Elk Hair Caddis, Humpies and the like. I seem to recall that one of my favourites was a “Royal Humpy” whilst Schalk preferred a “Rat Faced McDougal, some days we would venture out with little more in the fly box than a selection of hoppers, matching the hatch was for sissies, these were real fish in search of a real meal. Darn I think that there were still barbs on those hooks and certainly Schalk would always take a few fish home for supper. I recall once fishing behind Schalk when he broke off on the strike to a fish, a remarkable achievement in itself; I doubt the tippet was less than 6 lb breaking strain. That Rat Faced McDougal popped up from the depths right in front of me and I picked it off the water and gave it back to Schalk, some indication of the size and buoyancy of the pattern. If you wanted to kill a fish the size limit back then was 10” and I think that one could keep quite a few fish if one wished, It could have been as many as ten per day although I don’t honestly recall. What I do remember is that by the season’s end almost all the fish in the stream would be nine and a half inches long or less. Regretfully Schalk passed on and new fishing partners came and went, but we kept on working on improvement. We also developed a highly effective manner of dealing with the occasional difficult or selective fish, we simply went and found another one that was more accommodating, it worked every time. If you do that today you are going to be finished with your beat by lunchtime, some level of experimentation and effort is no required and you can’t simply move on to the next fish at each refusal. Of course over time things change and they did for us, we promoted catch and release fishing, to start with only the upper beat of the Elandspad was subject to this regulation and even then the old school were complaining about it. Comments such as “it isn’t really fishing if you don’t take a frying pan with you” were commonplace and we were troublesome young bucks with some hidden agenda, equally vilified and distrusted by the more established anglers. Mind you as with everything else there was more pressure on the streams, more trouble with people getting in each others way on the river and leapfrogging groups would effectively put the fish down for everyone. The beat system was born where you could book your section for the day which not only meant that one could enjoy uninterrupted fishing, but equally that you didn’t have to rise at sparrows fart simply to secure some privacy. The catch and release regulations spread, the fish, given the opportunity to learn from their mistakes started to get smarter and better educated. No longer would they always come twice and the rainbows started to rise in far more circumspect fashion than was previously the case. Reacting more like cautious browns, sipping in flies and eschewing any poor presentations or dragging flies. The fish were getting smarter, they still are. In fact on our brown trout stream some of the fish had been tagged and we would discuss the relative condition and latest measurements of number 423567 as each season passed. It wasn’t scientific but it proved one thing, that the fish would survive capture if you were careful with them and it laid to rest the argument of the old timers who insisted that the trout was going to go “belly up” anyway so you may as well chuck it in a pan and have it for lunch. We started to change tactics in response to changes in the fish’s behaviour, gradually flies got a lot smaller and I well recall bringing back from Australia the first size 22 hooks that we had ever actually seen. 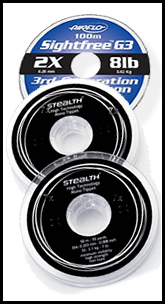 We stopped simply using nylon and purchased “tippet” material on neat little spools that cost the earth but offered better presentation. Gradually the terminal tackle got thinner and we started going out on a limb with 6 X tippet and eventually 7X (currently the extreme is 8X and even 10X is now available in local stores). We built our own ultralight rods, to start with the Orvis “Superfine 7’ 9” #2 weight became the standard, those with the old favourite “Osprey #4’s” were now regarded as little more than hackers. The availability of fine soft tippet material is still probably one of the greatest weapons in the stream angler's arsenal. With the advent of light rods and catch and release we were now fishing barbless hooks all the time, we had figured out that you actually land more fish on those and we started to sharpen our hooks, first with pebbles from the stream bed and later with purpose built diamond dust hones carried in our pockets. Leaders got longer and finer, we degreased them to make them sink and took much more care in our positions and presentations on the streams. The fish were larger now, larger and wiser and consequently more demanding. There were even occasions when one would have to match the hatch, particularly if there were ants on the water. A further and oft ignored development of the Catch and Release regulations was that at one level information was more easily passed from one angler to another. Now there was no need to hide the truth about the flies which one fished or the best beats or your knowledge of a good fish on a particular section. Previously one would keep quite, not wishing to encourage someone to improve only to go and whip out your favourite nineteen incher tucked away under the bushes of “dry fly run”. Whilst all the time the fish were getting better and better at the game as well, it may seem an unfair battle , what with us using micrometer measured tippets, carbon graphite rods, camouflage clothing, fancy dry fly floatants, hooks sharpeners and all the mod cons but I am not sure that our catch rates ever climbed that much. We would do better for a while but the fish would get smarter and things would level off again. Of all the improvements in gear, using your brains is still what will keep you ahead. Today the streams of the Limietberg probably offer the most technically demanding fishing in the country. There are plenty of fish to be sure, and there are some really good ones too for that matter, but they are a whole heap more demanding of the angler compared to the days of climbing down those bridge supports in search of supper. We don’t actually fish in a pristine natural environment, much as we may enjoy the illusion, we fish in the midst of a highly technical arms race where we get better weapons and the trout continuously update their defenses. I have to confess that this is the way that I like it, but there is one down side, beginners to the sport are in for something of a rough ride without help. The trout on these streams have already received their education and if you are a neophyte angler you start off at something of a disadvantage. The only option is to go out on the water and start working on your education to catch up. Shortly the Cape Piscatorial Society, together with Bell’s Whiskey, will host the latest “Bell’s Fly Fishing Festival“. Unlike most other fishing festivals it isn’t a competition. In the context of this article it is more like “infantry school”, where newcomers can get some on stream experience from old hands and learn some of the subtleties and tricks of the trade. In times past this may have simply been a fun way to spend the weekend and a means of perhaps improving one’s catch rate. Today, with the arms race if full swing it is more of an essential right of passage. Without some help it is going to take the average newcomer a lot of time on the water to catch up. 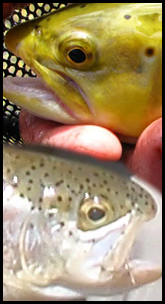 As said previously, if you are starting out, the fish are way ahead of you and learning more each season. This article is dedicated to those who came before us and created this fishery and the people who still look after it for the benefit of all. It is also in recognition of the assistance offered by Bells and the dedicated anglers who act as guides, who provide the means for so many newcomers to get a start at this wonderful obsession we call fly fishing. Welcome to the arms race. Brought to you by Inkwazi Fly Fishing Safaris and Stealth Fly Rod and Reel. Brought to you by Inkwazi Flyfishing Cape Town's best fly fishing guiding service. 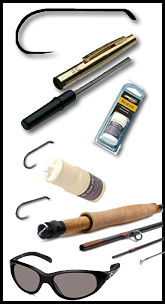 This blog was brought to you by Inkwazi Fly Fishing in conjunction with STEALTH FLY ROD AND REEL. Disclaimer: These blogs sometimes attract Google Ads advertising, we have no control over their appearance nor do we derive any financial benefit from their presence. Whilst they may prove of value to you appearance of these adverts does not infer any relationship with or endorsement by the participants of this blog. This entry was posted on October 11, 2010 at 9:00 am and is filed under Cape Streams, Fishing. You can follow any responses to this entry through the RSS 2.0 feed. You can leave a response, or trackback from your own site. As always Tim, another great post and also, another reason I’m looking so forward to participating in the Bells event this weekend. Thanks Brian, glad to be able to keep everyone entertained and greatly appreciate the feedback. Look forward to meeting up on the weekend, although by then I am going to be pretty finished. Guiding every day this week.